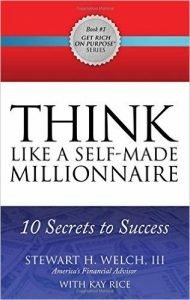 Think Like A Self Made Millionaire | Kay Rice, M.Ed. 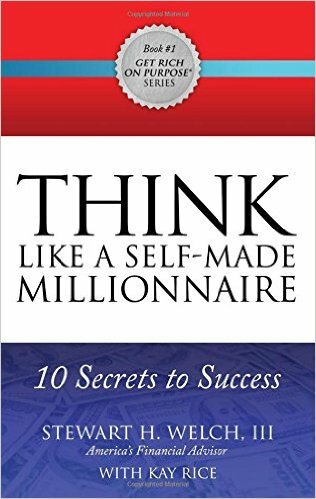 In THINK Like a Self-Made Millionaire: 10 Secrets to Success, learn the success secrets of virtually all self-made millionaires. You’ll pick up proven strategies and action steps to help you achieve sustainable financial freedom, peace of mind, and life success! Through the Get Rich on Purpose® series, America’s Financial Advisor, Stewart H. Welch III, shares the financial expertise and wealth “secrets” he learned while going from an average twenty-something to self-made millionaire before the age of forty. You may wonder how I managed to get my name on the front cover of this book with one of the top and most sought after financial advisors in the country,right? Well, as you may imagine there is a story behind that, and a few lessons. Stewart’s firm, The Welch Group, LLC is one of the top “Fee for Service” financial advisory firms in the country, managing over a billion dollars in assets for their clients. He’s appeared weekly on Fox News in a segment called “Money Tuesday” for years, and writes a weekly column in the Birmingham News, one of the top circulated papers in the South East. I happened to meet him at an event we both attended. I never imagined at the time that meeting would turn into a long-term friendship and I would end up with my name on the front of a book with him! I was in search of excellence. I wanted to know what sets really successful people who achieve great things in life apart from those set goals and never seem to attain them. For example, how many people do you know who have been “trying” to lose weight for years, but don’t? Or those who want to achieve financial freedom but are struggling week to week just to make ends meet. While I was reading books and studying the strategies and beginning to implement them in my own life, Stewart had already mastered these strategies and had a tremendous amount of success under his belt. He and I agreed that regardless of whether you want to become financially free, or become a multi-millionaire, or lose 100 pounds and have a fit and toned body, the success strategies are the same. The rest is getting the right information and techniques that apply to your particular goal. This book applies those success strategies to the area of finance. In a second project we worked on together, The Ultimate Fitness Quest, Stewart challenged himself to see what he could achieve in the area of his health and fitness using these same success strategies. And you know what?? It worked! On that project, not only did I get to handle the logistics on the back end, but I was also on his panel of experts as his Nutrition Coach and provided him with the program he used to lose 17 pounds of body fat and significantly improve his body composition all within 40 days. I hosted a second UFQ Challenge for him in 2016 and we allowed others to participate and follow along. Here’s an excerpt from the book on turning your dreams into reality: Few of us take the time to stop and take stock of our lives, but if you take a moment to reflect, you will find that you, in fact, accomplished quite a lot in the past year. But did you achieve your full potential? It’s likely that your full potential is much greater than even you recognize. For each of us, our destiny is to have an extraordinary life. Yet it is up to us to claim it. I challenge you to commit to break the chains that are keeping you from achieving your true potential. Develop your dream list. Start with blank paper and write down everything you would do, own, buy and accomplish if there were absolutely no barriers to your success. List everything you can imagine. This is where you want to think big and have some fun. Create a “Vision” of your future. What would you be willing to totally commit to accomplishing? From your dream list, choose one or two things you feel the strongest passion about and write them down on a separate piece of paper. The greater the detail, the better. Develop and Action Plan. Between where you are now and the achievement of your vision, you’ll find a number of ‘Critical Success Factors’. These are the critical things that you must do to create success. List as many as you can think of along with supporting ‘actions’. Include target timelines for each critical success factor. Commit 100 percent! Commitment is evidenced by daily focus. I believe that whatever you constantly focus on will come to pass. It is this constant focus that is the engine for achieving greatness. Each day you should include a minimum of three action activities that move you closer to the realization of your vision. You can have the life of your dreams if you’ll accept the responsibility for making your dreams a reality. You might like to know what those 10 Success Secrets are, right? Okay, I’ll share them with you right here! Think Like a Self-Made Millionaire is available at your favorite book retail store.